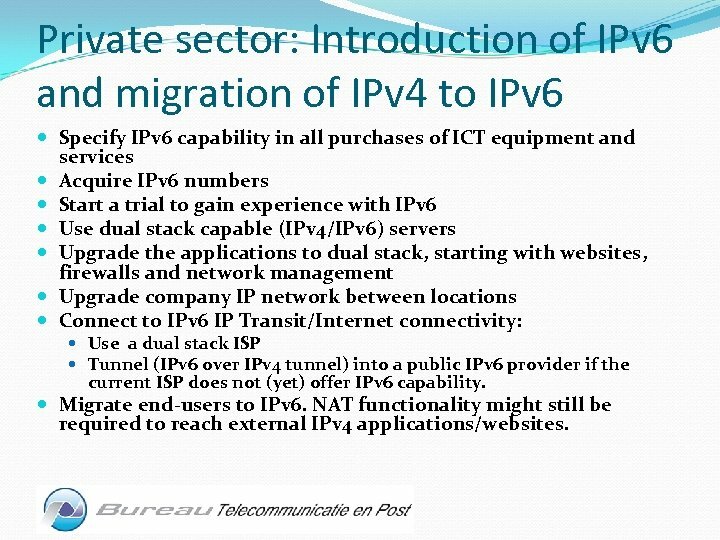 Private sector: Introduction of IPv 6 and migration of IPv 4 to IPv 6 Specify IPv 6 capability in all purchases of ICT equipment and services Acquire IPv 6 numbers Start a trial to gain experience with IPv 6 Use dual stack capable (IPv 4/IPv 6) servers Upgrade the applications to dual stack, starting with websites, firewalls and network management Upgrade company IP network between locations Connect to IPv 6 IP Transit/Internet connectivity: Use a dual stack ISP Tunnel (IPv 6 over IPv 4 tunnel) into a public IPv 6 provider if the current ISP does not (yet) offer IPv 6 capability. 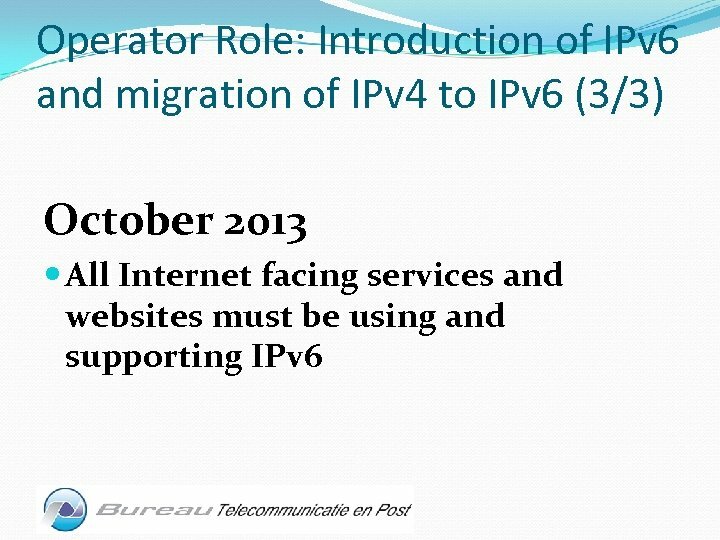 Migrate end-users to IPv 6. 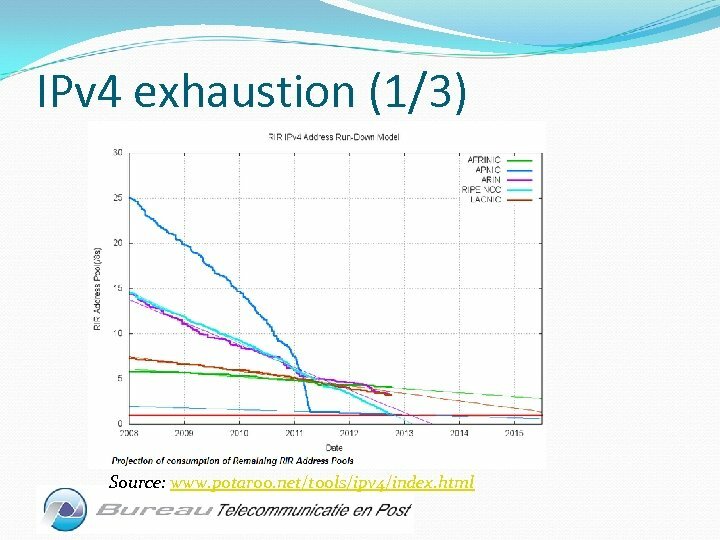 NAT functionality might still be required to reach external IPv 4 applications/websites. 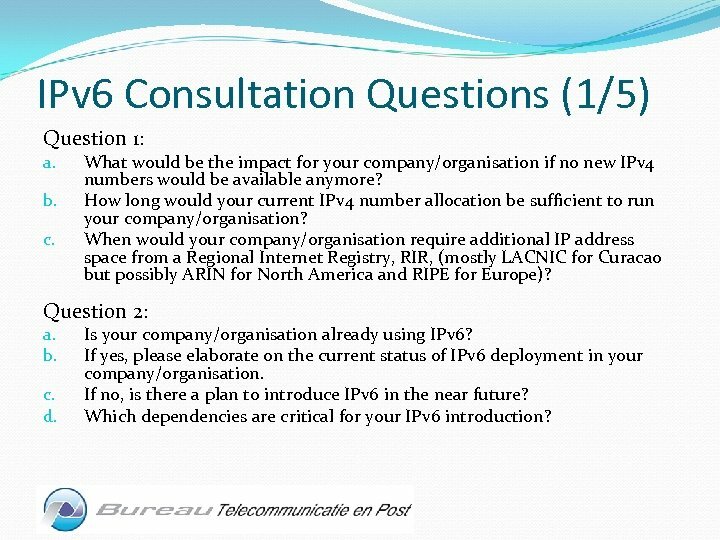 IPv 6 Consultation Questions (1/5) Question 1: a. b. c. What would be the impact for your company/organisation if no new IPv 4 numbers would be available anymore? 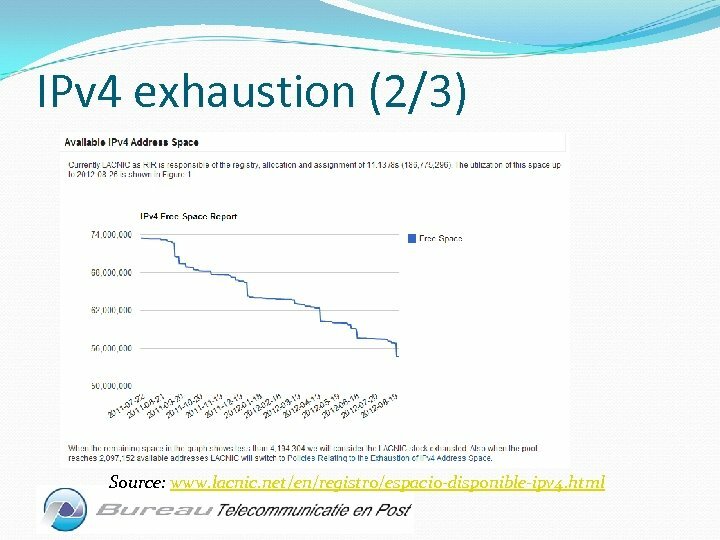 How long would your current IPv 4 number allocation be sufficient to run your company/organisation? 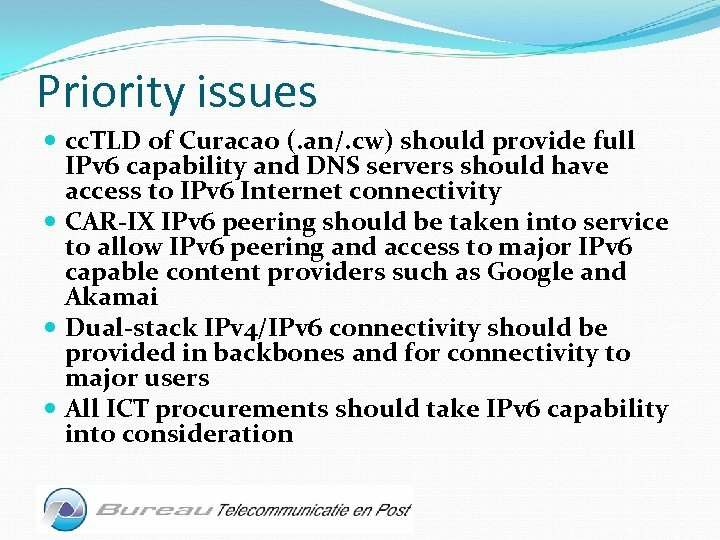 When would your company/organisation require additional IP address space from a Regional Internet Registry, RIR, (mostly LACNIC for Curacao but possibly ARIN for North America and RIPE for Europe)? 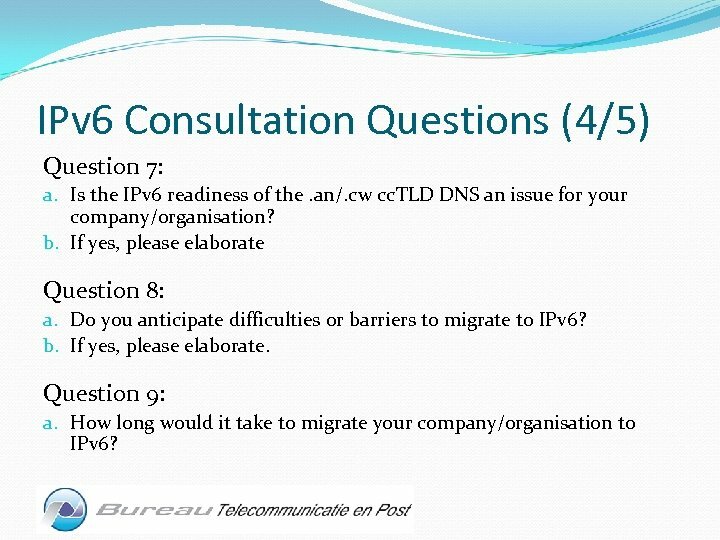 Question 2: a. b. c. d. Is your company/organisation already using IPv 6? 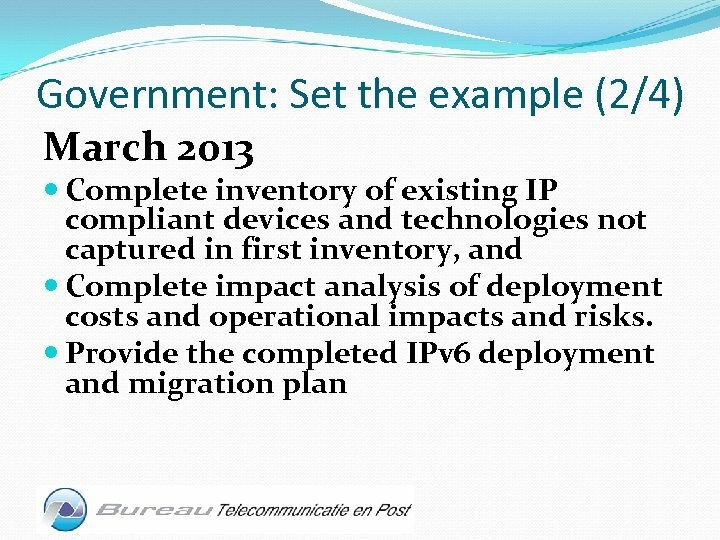 If yes, please elaborate on the current status of IPv 6 deployment in your company/organisation. 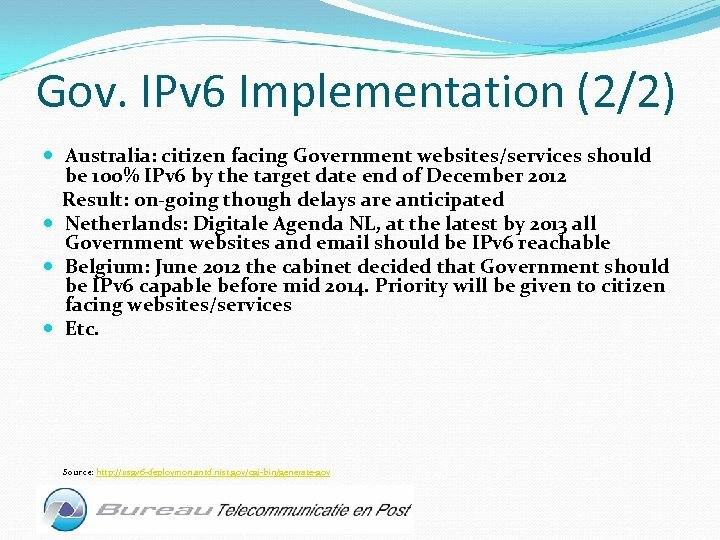 If no, is there a plan to introduce IPv 6 in the near future? 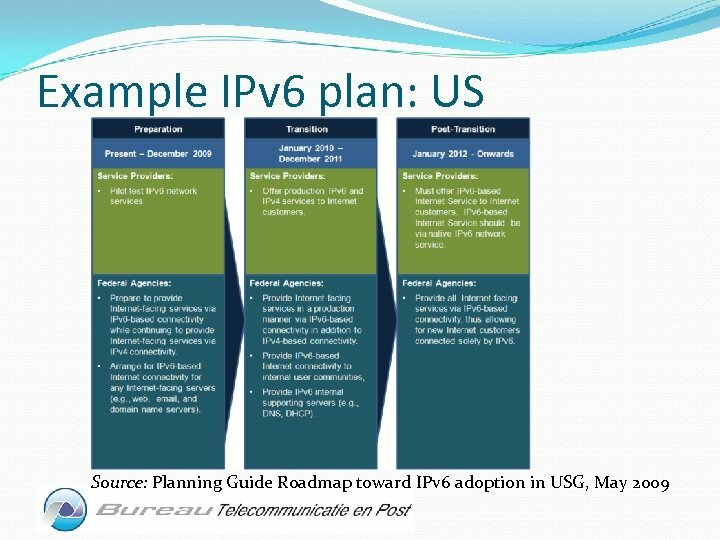 Which dependencies are critical for your IPv 6 introduction? 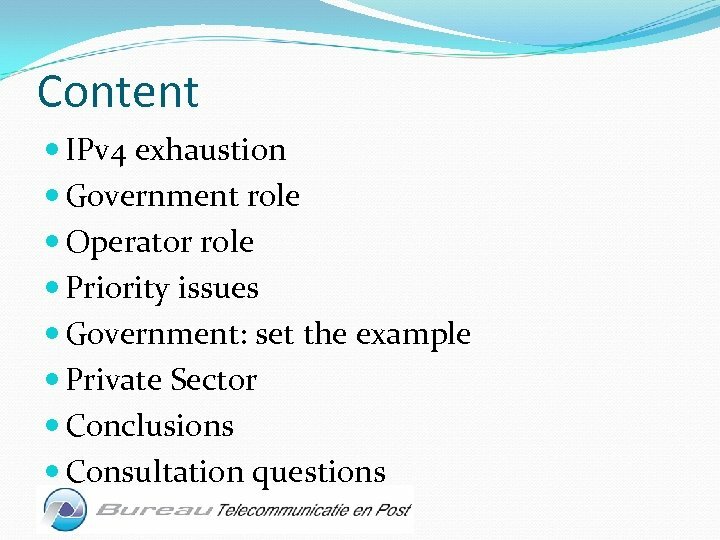 IPv 6 Consultation Questions (2/5) Question 3: a. b. 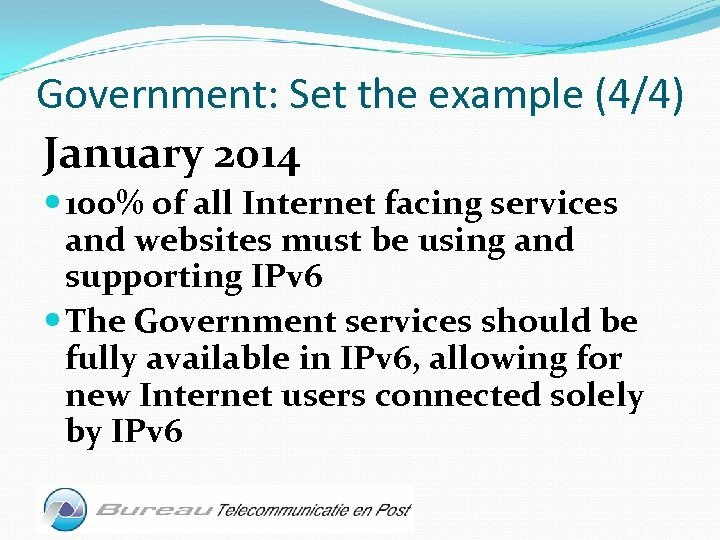 Are your websites (and other on-line services) ready to accommodate IPv 6 only users (for example an IPv 4/IPv 6 dual-stack website)? How would your company/organisation be affected if an increasing number of world-wide IPv 6 -only users would not be able to reach your websites (and other on-line services) anymore? 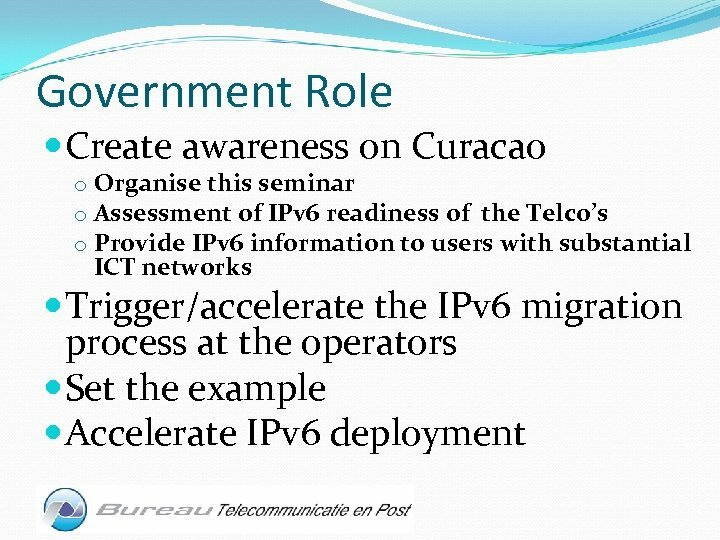 Question 4: a. b. c. Do you have an IPv 6 capable Internet connection? If yes, how did you realise an IPv 6 internet connection? 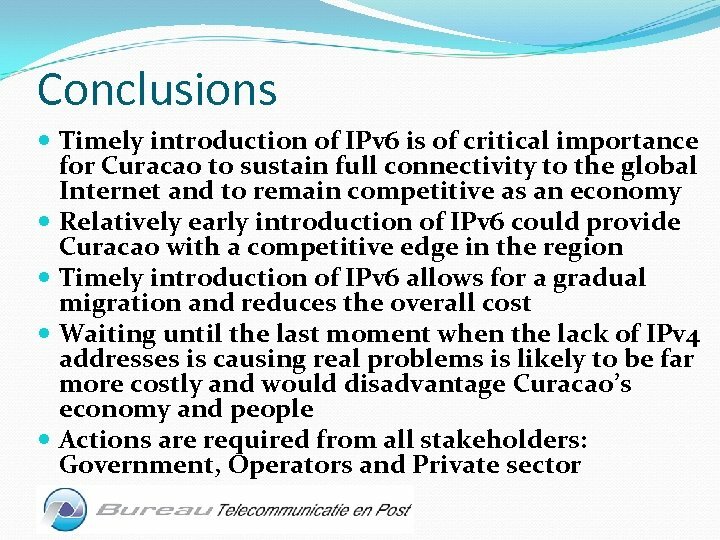 If no, are there any plans to get an IPv 6 capable Internet connection in the near future? 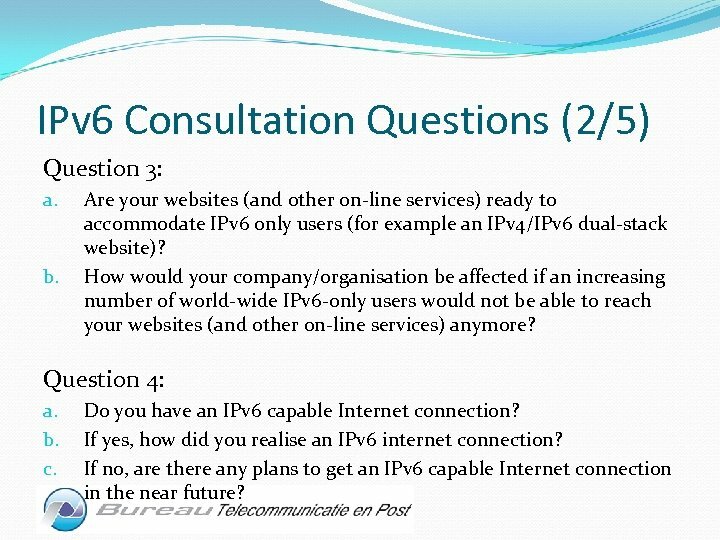 IPv 6 Consultation Questions (3/5) Question 5: a. b. c. When do you expect to provide IPv 6 capability on your main external websites (and/or other on-line services)? 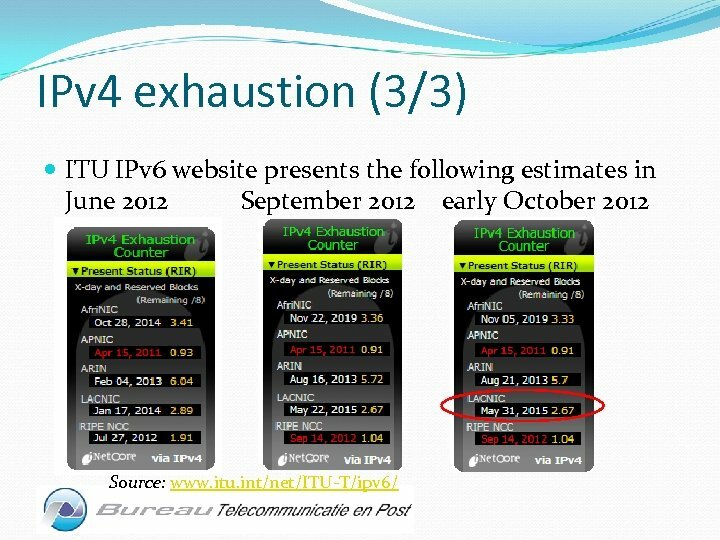 When do you expect your internal network to be IPv 6 capable? 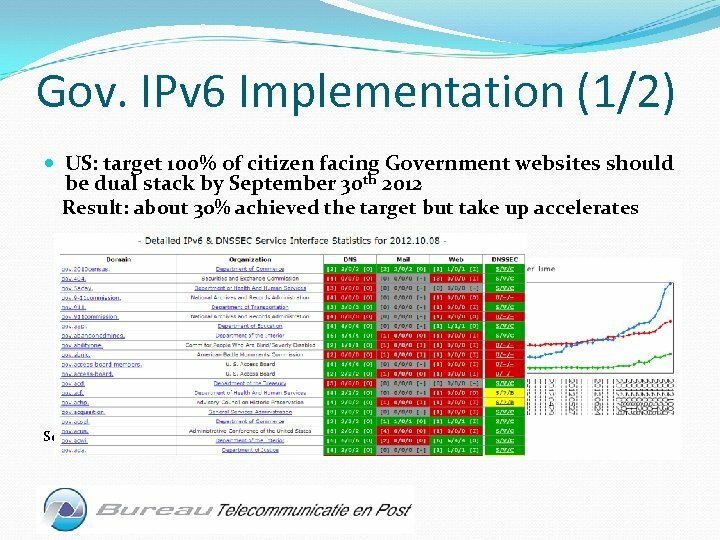 When do you expect to be able to use IPv 6 towards IPv 6 only websites/services? Question 6: a. 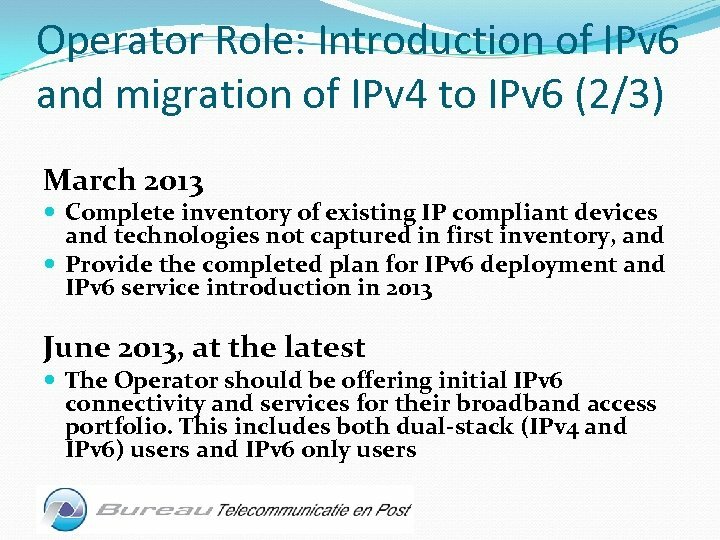 Would you consider buying IPv 4 numbers on a “secondary market” just to avoid or delay IPv 6? b. 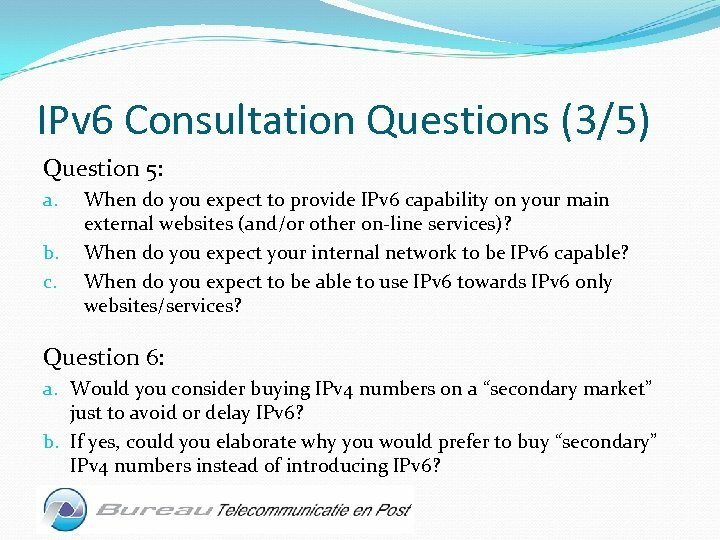 If yes, could you elaborate why you would prefer to buy “secondary” IPv 4 numbers instead of introducing IPv 6? 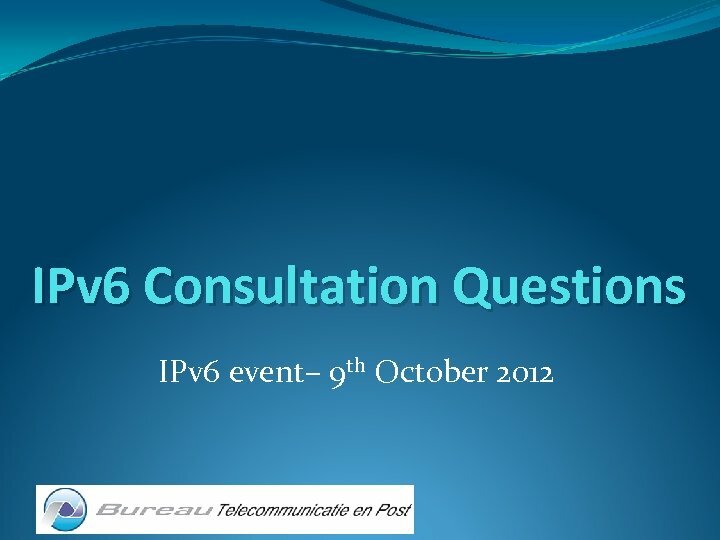 IPv 6 Consultation Questions (4/5) Question 7: a. Is the IPv 6 readiness of the. an/. cw cc. TLD DNS an issue for your company/organisation? b. If yes, please elaborate Question 8: a. 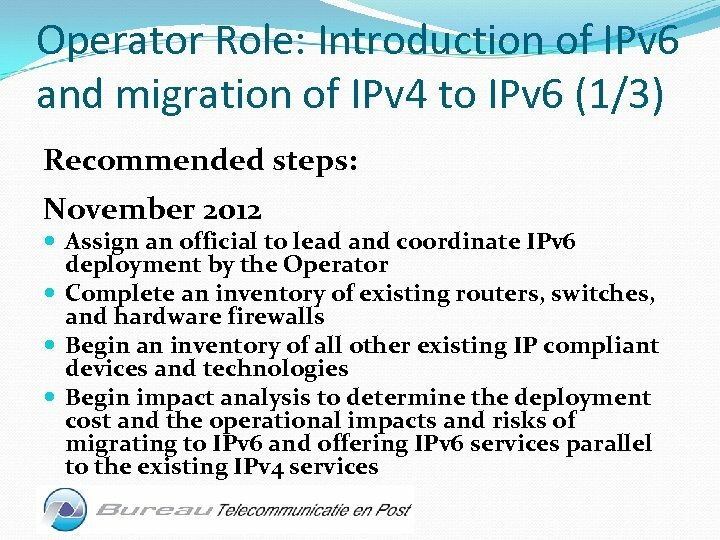 Do you anticipate difficulties or barriers to migrate to IPv 6? b. If yes, please elaborate. Question 9: a. How long would it take to migrate your company/organisation to IPv 6? 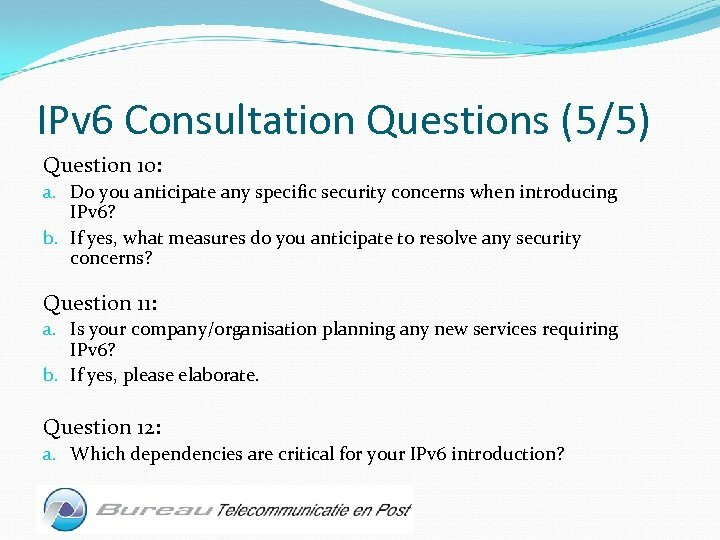 IPv 6 Consultation Questions (5/5) Question 10: a. 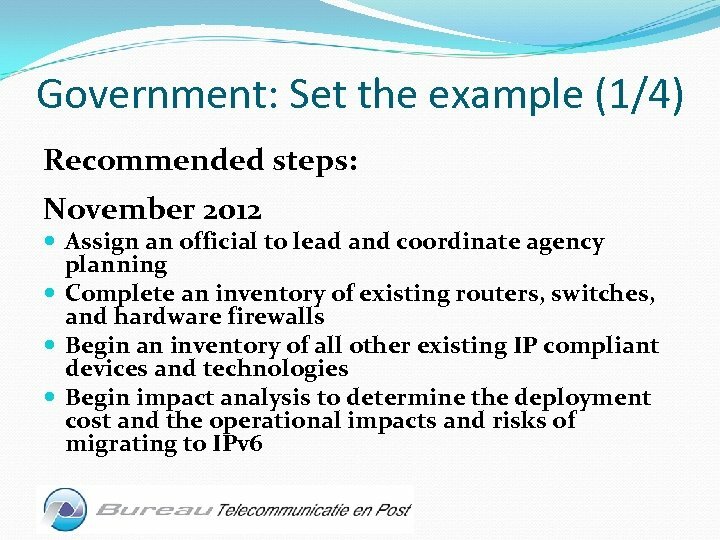 Do you anticipate any specific security concerns when introducing IPv 6? b. If yes, what measures do you anticipate to resolve any security concerns? Question 11: a. 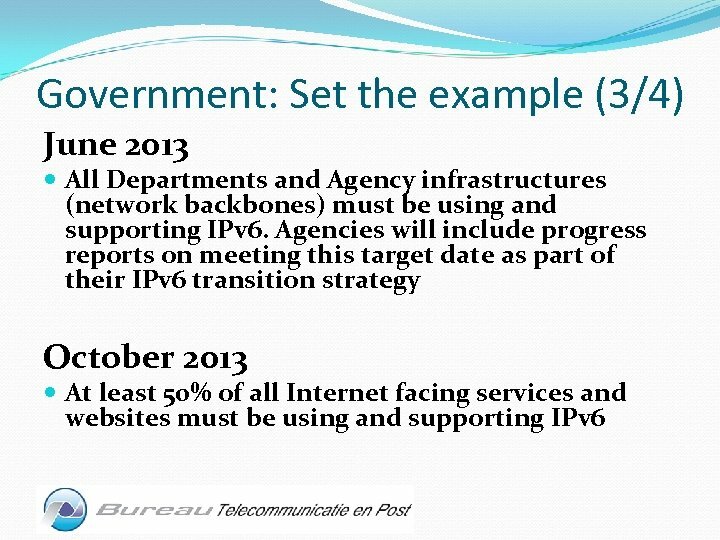 Is your company/organisation planning any new services requiring IPv 6? b. If yes, please elaborate. Question 12: a. Which dependencies are critical for your IPv 6 introduction?